For years after the suspicious death of his wife, single dad Wyatt Monroe isolates himself on his Wyoming ranch…until he's accused of murder. With a body at his doorstep, he's arrested and Wyatt has only one hope—a blue-eyed, blonde bodyguard. But it'll take more than skill for work-obsessed Jackie Blain to save her reluctant client, who just wants to be left alone. She'll have to gain his trust by keeping him and his daughter safe. With their lives in her hands, Jackie is faced with her toughest assignment ever—saving the cowboy and guarding her heart. There was a dead man on his porch. Wyatt Monroe looked into the man's beaten face. Dried blood covered his body in dark splotches. Purple bruises mottled his skin. Lifeless eyes stared back at Wyatt. Recognition rocked him back on his heels. He grabbed his cell from his back pocket and dialed 911. 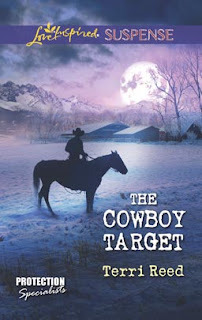 His gaze scanned the buildings of his ranch—his foreman's house, the hay barn and stables, the equipment shed, feed shed—and the Wyoming landscape beyond, searching for the threat. Snow swirled in the air and covered the pastureland spread out over the sixty-thousand-acre ranch. All appeared quiet and undisturbed on this brisk March morning. "Lane County Emergency Department," the female operator answered. "What's your emergency?" "Eleanor, this is Wyatt Monroe." He could picture the older woman who'd been manning the town's emergency line for longer than he could remember. But that was life in Lane County, Wyoming. Predictable and steady. The way he wanted his life to be. Sans dead bodies. "Is Gabby okay?" The concern in Eleanor's voice wrapped around Wyatt and squeezed. Too many people in this town wondered if his little girl was safe with him. Three years after his wife, Dina, had died, he couldn't escape the speculation and suspicion. Even from her grave she was wreaking havoc with his life. That was what women did. They wormed their way into a guy's heart and then stomped all over it. His mother had done it to his father. Dina had done it to Wyatt. His gaze lifted to the second f loor of his family home. The dormer window with the pink, frilly curtains was closed to protect his four-year-old from the winter weather. But how protected could she be if someone had dumped a body on his front porch so callously? "Gabby's fine," he said, assuring himself as much as Eleanor. "It's George Herman." Eleanor snorted. "What's that rascal gone and done now?" Wyatt's gaze strayed back to the bloodied, lifeless body of his ranch hand. Gaping wounds littered his torso. Bruises covered his face. The skin of his knuckles had been scraped raw. Poor George. It was no secret Wyatt and George hadn't seen eye to eye on most things. But the man had been a hand on the Monroe Ranch since Wyatt had been old enough to sit a horse. Wyatt couldn't bring himself to fire him. He and Dad had been friends. And George didn't have anyone or anyplace else to go. "Got himself killed." A shudder worked through him. He worked to keep his voice calm. "I found him on my front porch." The silence on the line was as loud as a shotgun blast. Wyatt swallowed back the memories of the last time he'd had to make an emergency call. The night Dina had died. The night the town had turned on him, accusing him of murder. A burn spread through his belly. Her death had been an accident. But few believed him. Including his own mother. Which solidified his belief that women couldn't be trusted with his heart. "I'll inform the sheriff," Eleanor stated with a decidedly cool tone to her voice. "Appreciate it," he said and hung up. The front door opened behind him with a barely discernible squeak. Wyatt pivoted and strode toward Gabby, her sweet, freckled face peering through the crack in the doorway. He shooed her back inside with a wave of his hands. "It's too cold for you to come outside in your jammies." He stepped inside the warm house and firmly shut the door behind him. His daughter didn't need to see the horror on the porch. Gabby lifted her arms. "I want pancakes." "When Penny comes over, I'm sure she'll make you some pancakes—if you ask politely." He glanced at the clock. His pulse still thundered like the horses he bred. Penny would be here any minute. His foreman's wife watched Gabby during the day while Wyatt worked. Swinging Gabby into his arms, he carried her into the living room and deposited her on the worn brown leather couch. "For now, why don't you snuggle up under this blanket?" He tucked a fussy blue blanket around her tiny body. "As a special treat today, you can watch some TV before breakfast." Her bright green eyes lit up. "Barney!" The favorite of every preschooler. He kissed the top of her curly red head before turning on the television and tuning into the channel with the big purple dinosaur. "Gabby, I need you to stay right here, okay?" She didn't answer. Her attention remained captivated by the singing character on the screen. Love for this little child pierced his heart. He searched her sweet face. She looked so much like Dina, the same red hair, the same freckled nose and emerald eyes. He didn't see any of himself in Gabby. Like a knife, the thought sliced as deeply as it always did when he let his mind travel down that perilous road. A scream from outside split the air. Wyatt flinched. Penny had arrived. He'd hoped to get back out front before she'd walked over. One last glance at Gabby assured him she was too engrossed in her show to have heard the scream. He hurried out the front door. Penny Kirk clutched a hand over her mouth and held on to the porch railing with the other. Beneath the bright red wool cap pulled low over her graying hair, her lined face was pale, her eyes wide with shock. Grimly stepping over George, Wyatt went to Penny and steered her away from the sight of the dead man. Her scream had brought others pouring out of the outer buildings. Penny's husband, Carl, ran to his wife's side. His untucked plaid shirt flapped against his denim-clad thighs, and white shaving foam covered half of his face. "What happened? Are you hurt?" He wrapped his arm around Penny. "George," she said and broke into tears. Wyatt met Carl's gaze. Gesturing with his head, he announced, "He's dead. On the porch." Carl's gaze widened. Wyatt saw the questions, the suspicions, and knew this was just the beginning of what promised to be a mess. Wyatt recaptured Penny's gaze. "Gabby's inside watching TV." Penny's eyes filled with horror. "Did she.?" Wyatt shook his head. Thankful for that. Penny blew out a breath of relief. "I'll go to her." Grateful to the older couple who'd virtually adopted him and Gabby as family, Wyatt knew he and Gabby wouldn't have fared well without them over the years. They'd come on board the ranch before Wyatt's dad passed on, had witnessed the turmoil of Wyatt's marriage and had stepped in as surrogate grandparents for Gabby as soon as she was born. Dina had resisted their help, but Wyatt thanked God for them every day. The sound of tires coming up the snow-packed gravel drive drew Wyatt's attention. The sheriff's brown sedan pulled to a stop. Two deputy cars and the medical examiner's van pulled in behind him. Wyatt went to meet the law officer, who was climbing out of his vehicle. Sheriff Craig Landers was tall and broad shouldered beneath his brown leather jacket and tan uniform. His salt-and-pepper hair poked out from the curled edges of a tan Stetson. His sharp gray eyes took in everything. The crowd of ranch hands circling the front porch, the body lying at the top of the stairs. And Wyatt. Forcing himself to stand taller, Wyatt met his stepfather's gaze head-on. The older man's eyes narrowed. "Give me the low-down." "I came out front about twenty minutes ago and found George just as he is." "You didn't move the body, did you?" "No." Wyatt had learned the hard way that contaminating a crime scene would only make him look guilty. At least, it had with Dina. He'd tried to give her CPR. Her blood had ended up on his clothes. For some, that was enough to label him responsible for her death. Thankfully, Wyatt had God and a lack of incriminating evidence on his side. He could only hope and pray God would see him through this ordeal, too. "Good." Landers strode forward. "Okay, everyone back away. Let Andrew through," he said, indicating the medical examiner. Wyatt watched as Andrew, an older man with a full beard and wire-rimmed glasses, examined the body. George had been ornery and arrogant, but he didn't deserve to die. Who would do this? And why leave him on Wyatt's porch? "Wyatt, you understand we have to search the grounds." Landers's voice broke through his thoughts. The sheriff's voice held a note of compassion. "Knock yourself out," Wyatt stated. He didn't have anything to hide. And he intended to be right on their heels doing a search of his own. Nobody harmed one of his people. "Tell your boys to be mindful of Gabby. She's in the living room watching television." Wyatt turned toward where a deputy stood beside the open door to Wyatt's dark blue truck. Winter sunlight glinted off the object the deputy held up with a gloved hand. The air left Wyatt's lungs in a rush. His steel-bladed hunting knife, covered in blood. Jackie Blain punched the freestanding, heavy black bag. Jab, jab with the right hand. Whack with her left elbow. Right foot roundhouse kick. Jab, jab. Whack. Kick. She focused on the punching bag with single-minded attention. For the moment, she was in the heat of battle against an imaginary assailant wanting to part her from her client. Not happening on her watch. Ever. That was why she trained two to three hours a day. At least, every day that she wasn't on an assignment. The trilling sound of her cell phone broke through her concentration. Giving the bag one last jab, she whirled away and jumped over her sleeping English bulldog, Spencer, to grab the phone off the island counter. "Jackie, it's your uncle Carl," the voice on the other end said in her ear. Taken by surprise, she smiled. Carl was her mother's older brother. "Hey. Wow, long time no hear." She picked up a white terry-cloth towel from the pile sitting atop the bar stool and wiped her face and neck. "The street runs both ways, young lady," her uncle chided. "Yeah, I know. Sorry 'bout that. I did call at Christmas and left a message." "I know. And we were remiss in not returning the call." She shrugged away his comment and turned to stare at the present they'd sent, an eleven-by-eleven landscape painted by a local Wyoming artist, which hung on her kitchen wall. The gift canceled out not returning her call. Walking to the window of her apartment located in Boston's Back Bay neighborhood, Jackie pushed the blinds apart with her free hand. A fresh layer of snow covered the street below. Beyond the roofline of the apartments across the street, the downtown Boston skyline glistened in the midmorning winter sun. She never tired of looking at the city. So different from the flat cornfields of Iowa where she'd grown up. "So, how are you? Have you heard from my parents?" "We're okay," he said, but something in his tone didn't ring true with his words. She dropped the blinds back in place. Her heart sped up. Her breath lay trapped beneath her ribs. She hadn't heard from her parents in a couple of weeks. They were on a cruise in the Mediterranean. "And Mom and Dad?" "They're good as far as I know," he quickly assured her. Tension left her body in a rush of relief. "But something's wrong." "Yes. We could sure use your help," Carl said. She blinked. Her uncle and aunt had never asked for anything from her before. This must be serious. "Sure. What do you need?" "It's Wyatt Monroe. He needs you." Sinking into the reclining leather love seat, her one piece of furniture that hadn't come from a secondhand store, she asked, "Your employer? Needs me?" She'd never met Mr. Monroe. In fact, she'd never visited Wyoming, where her uncle and aunt lived. She'd thought about it back when her life had turned upside down. But then she'd found Trent Associates and, well, she never got around to making the trip that far west. She'd returned home to Atkins, Iowa, a couple of times, but preferred her parents to come to Boston. Going back to her hometown only stirred up old anger and humiliation. And reinforced the painful lessons she'd learned about love. Never fall for someone you work with. And never, ever give anyone that much power over your heart. She shuddered and pushed away the memories threatening to surface. She had a good job now with Trent Associates as a protection specialist. She had a place to belong. She had coworkers who respected her, cared for her and made her feel connected. Protecting others was what she was good at. And she had her dog, Spencer, for company. That was all she needed. "Wyatt's in trouble." Carl's words broke through her thoughts. "Someone's framing him for the murder of one of his ranch hands." That piqued her interest. And raised her skepticism. Four years as a deputy sheriff did that to a person. "Are you sure he didn't do it?" "I know he didn't." His voice was adamant. Still, old habits of suspicion held firm. "Are you his alibi?" After a moment's hesitation, he said, "No. He doesn't have one." "Not good for him." She kicked off her cross-trainers with a sigh. Her feet cooled immediately. She'd worked up a sweat on this cold March morning. "I trust he has a good lawyer?" "I've hired one. Against his wishes." Jackie frowned. "Is his objection to you hiring the lawyer or to the lawyer himself?" Carl heaved a beleaguered sigh. "Both. He's innocent and doesn't see why he needs a lawyer." Either the man was overconfident in the justice system or not right in the head. Jackie figured it was probably a little of both. "What can I do to help?" "Would you come here? Help us prove he's innocent?" She sat back. "Uncle Carl, I'm not in law enforcement anymore. I'm sure the police there will do a thorough investigation." "Maybe. But I'd feel better if you'd come out and keep an eye on the investigation. There are complications." "What kind of complications? Either he did the deed, or he didn't. The evidence will prove it one way or another." "It's not that simple here. Wyatt has a past," Carl said. Jackie wrinkled her nose. "We all have a past, Uncle Carl. That won't affect the evidence." "What if someone wanted it to?" Her mind jumped back to Carl's earlier statement. "You really think someone is trying to frame him?" "I do." He lowered his voice. "Plus, there's bad blood between the sheriff and Wyatt that goes back a long ways." Not a mess she wanted to get involved in. "I have a job here. A good job." Even as the words left her mouth, she knew she was overdue to take some vacation time. Her boss, James, had gone so far as to tell her if she didn't take some R & R by spring, he'd bench her for a few weeks to give her some forced downtime. "Then I'll hire you if that's what it takes," Carl said with a flinty edge. He wasn't going to let this go. "This means a lot to you, doesn't it?" "Helping Wyatt means everything to Penny and me." Carl cleared his throat. "You know we wouldn't ask if it weren't important. If Wyatt is convicted of this crime… We can't let it happen. Gabby needs her father." Hey, if you order it this Friday, the Free Friday book is a Heartsong Presents title!